Catriona Finlayson discovered face painting when she was the Education Officer in a UK zoo, and came 5th in the World Face Painting Awards in 2007. She also won UK Professional Face Painter of the Year that year, followed by more awards. She began body painting whilst living in Hong Kong. She introduced professional face art teams to the Hong Kong Rugby 7s world tournament and was lead artist, speed-body-painting as many of the 40,000 fans as possible daily into their ‘costumes’ for 6 years. She also pioneered full-body freehand glitter tattoos as an art form and outfit for performers. Cat now works as a freelance artist (BodyPaintingByCat). 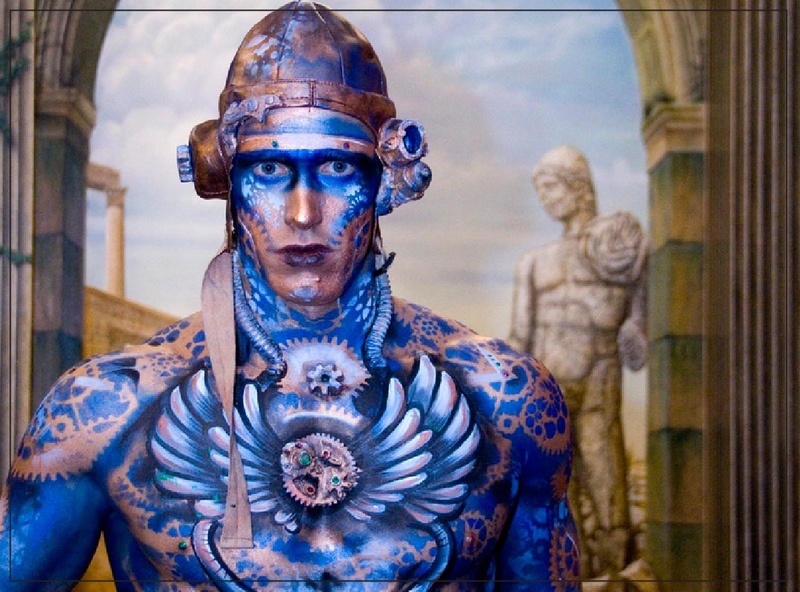 She adores body painting for clubs, parties, competitions and photo-shoots. She also glitters leotards for performers, murals for clubs and schools, and has decorated giant elephant, gorilla and dragon statues for urban arts projects. She paints and writes for industry magazines and books and sits on the FACE committee trying to raise standards and skills. She has won most of the UK competitions over the years and is the official artist for Paintopia, creating most of their promo images with Jennie Roberts. Cat and fellow artist Jennie Roberts now judge and demo at body paint and beauty events, as well as teaching and judging student work. In 2014 the duo qualified for the World Championships and were overjoyed to gain a place in the finals. They are now working on several paint series’ including free YouTube tutorials. They will be painting together at the event, and the model for their piece ‘Scariel’ will be Gracie Williams.